ERAI relies on information provided by Members and non-Members alike and, in turn, it is our duty to share not just data, but lessons learned, best practices and strategies in our quest to control the flow of counterfeit products and illicit business practices throughout the electronics supply chain. Although events such as the ERAI Executive Conference provide excellent venues for presentations and peer-to-peer discussions, the expense and time required for travel limits the number of employees that benefit from these collaborative learning opportunities. In looking to serve a larger sector of the industry and in response to member feedback, ERAI has focused our efforts to create an online training program called InterCEPT. This service aims to provide International Counterfeit Electronics Personnel Training for employees at all job levels in an easy-to-use and convenient format. 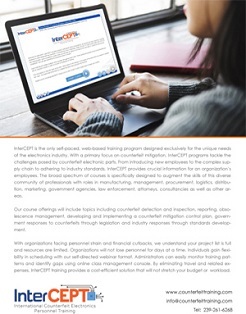 Working in partnership with thought-leaders in their respective fields, InterCEPT's classes center on counterfeit part mitigation while addressing counterfeit parts detection and avoidance through control plan development, inspection and testing as well as highlighting government and industry responses and solutions. By allowing administrators to purchase classes for their employees, we hope to provide an invaluable tool throughout varying job sectors to facilitate organizations challenged by flow down training requirements. InterCEPT was designed specifically for organizations that manufacture, procure, sell, integrate or test electronic parts. Please visit the Training tab to view class offerings, understand the student certification process and learn how the class management console, unique to InterCEPT, allows organizations to manage and document personnel training for internal and external auditing purposes.